The present investigation was undertaken to study the role of working conditions in occupational hazards among bidi rollers occupationally exposed to tobacco dust with reference to DNA damage in peripheral blood lymphocytes. Initially, biomonitoring was conducted by estimating urinary thioether to detect the extent of xenobiotic exposure, and genotoxicity was evaluated by assessing DNA damage and micronucleus frequency in buccal epithelial cells in female bidi rollers occupationally exposed to bidi tobacco dust. Student's t-test was used to test the significance between the means. 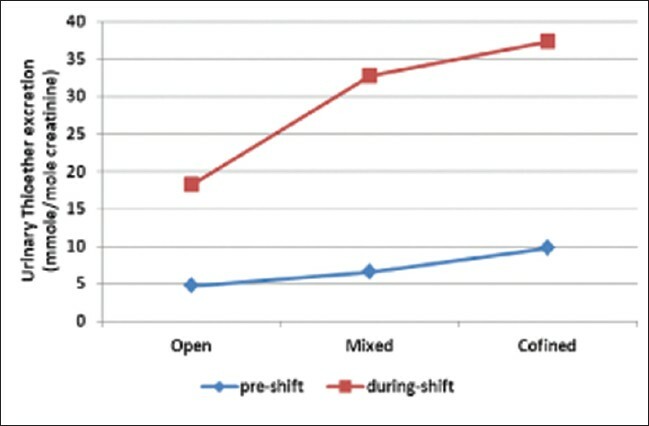 Results showed a significant increase in urinary thioether level in during-shift urine samples as compared to pre-shift samples, which indicated exposure of bidi rollers to xenobiotic compounds. A significant increase in DNA damage was observed in the rollers working in confined environment as compared to those who worked in open and mixed kind of working conditions. Keeping in view the adverse effects of tobacco inhalation on the genotoxic effects in bidi rollers as an occupational hazard and in order to minimize the hazardous effects, it is recommended that masks should be worn by the bidi rollers during work to minimize inhalation of tobacco dust. Gloves should be worn particularly if there are bruises etc. in the palm. To minimize the absorption through eyes, covered glasses should be worn. The entire process of bidi rolling may be done preferably under well ventilated conditions. Due care to be taken to sit in the direction facing the direction of wind to avoid inhalation of blown away tobacco dust. Occupational exposure to tobacco dust in bidi-industry workers has been shown to be associated with increased cotinine level, urine mutagenicity,  increased micronucleated buccal epithelial cell frequency  and elevated urinary thioether excretion,  which showed the increased mutagenic burden in workers. These bidi rollers are usually men and women of low socio economic status dwelling in confined, unventilated houses in semi urban/rural areas or slums in major cities. Bidi rolling under such environmental conditions predisposes them to chronic inhalation of tobacco dust and accompanying bio hazards. The present investigation was undertaken to study the role of working conditions in occupational hazards among bidi rollers occupationally exposed to tobacco dust with reference to DNA damage in peripheral blood lymphocytes. Seventy-two samples were included in the study. Age ranges from 18 to 65 years in both the groups. Initially, personal information that could have an influence on the results, namely duration of occupational exposure, smoking habit, use of drugs such as alcohol, other tobacco habits and radiological exams, their living conditions namely confined exposure or ventilated surroundings, was recorded in a proforma. Group III (Mixed): Bidi rollers, who worked in both confined and open conditions. Urinary thioether estimation was done to detect the extent of exposure of bidi rollers to various xenobiotic compounds by the method outlined by Kilpikari and Savolainen. Thioether concentrations of urine samples were determined in mmoles SH/mole creatinine. The mean level of thioether in pre- and during-shift urine samples of bidi rollers was 6.39±1.74 and 22.40±6.03 mmole thioether/mole of creatinine, respectively; the difference being significant (P<0.05), showing bidi rollers are exposed to xenobiotics during bidi rolling. A significant (P<0.05) increase in mean level of thioether in during-shift urine samples was observed in the workers working in confined (37.36±7.50), and mixed kind of working conditions (32.78±6.20 μm) as compared to workers worked in well-ventilated work place (18.28±4.10 μm). This indicates that confined environment predisposes the bidi rollers to inhale bidi dust and open environment tends to reduce the hazard [Figure 1]. A significantly (P<0.05) higher comet tail lengths was observed in bidi rollers (2.15±0.05 μm) as compared to controls (1.68±0.10 μm). It can thus be concluded that bidi rolling tends to cause significant DNA damage in workers as compared to non exposed population. A significant (P<0.05) increase in tail length was observed in the workers working in confined (2.50±0.10 μm), and mixed kind of working conditions (2.21±0.05 μm) as compared to those worked in well-ventilated work place (2.02±0.15 μm). This indicates that confined environment predisposes the bidi rollers to inhale bidi dust and hence, increasing the hazard in terms of DNA damage [Figure 2]. Bidi rollers, mostly women, are exposed to tobacco constituents via the cutaneous route or through inhalation of tobacco dust. In the present study, female bidi rollers were monitored for possible genotoxic effects of prolonged exposure to bidi tobacco and to study the role of working conditions in occupational hazards. Human population occupationally exposed to bidi tobacco dust was studied for urinary thioether excretion level as an indicator of exposure to xenobiotics. DNA damage was determined by alkaline comet assay on the basis of their working conditions. In order to ascertain that the bidi rollers are affected by the tobacco dust, thioether levels were estimated in their urine samples. 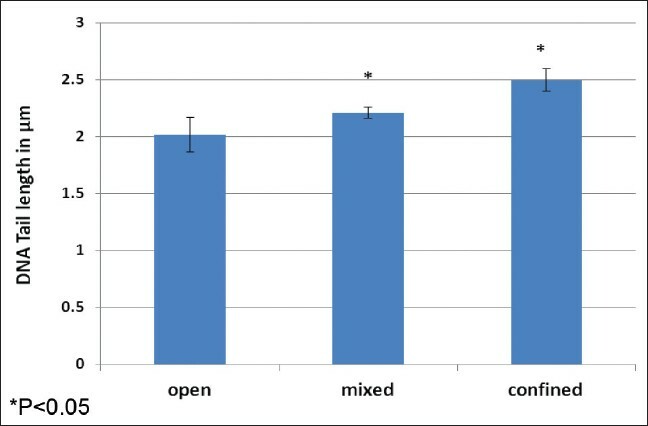 Since the influence of diet and other factors on urinary levels of thioether has been well documented,  hence, to avoid the resultant inter-individual differences, pre-shift samples from the same individuals were considered as controls and were used to estimate the baseline values of thioether level, and were compared with during-shift samples. The measurement of the concentration of formed thioethers provides an indirect index of exposure to potentially alkylating agents. In the present study, it was found that urinary thioether levels were significantly (P<0.05) higher in during-shift samples as compared to pre-shift samples which indicates that bidi rollers are exposed to xenobiotics during their occupation. The comet assay can sensitively detect DNA single strand break and alkali-labile sites. The results showed that occupational exposure to tobacco dust can significantly (P<0.05) increase DNA strand breakage. The findings of the present study show that bidi rollers had an increased level of DNA damage as compared to control population. Working condition is an important factor that contributes to the occupational hazard in the rollers, which is reflected in workers working in confined environmental conditions. It can thus be concluded that bidi rollers are exposed to xenobiotics in the course of their occupation, as evident by significantly increased urinary thioether level. Workers rolling bidis in confined environmental conditions are prone to significantly higher genotoxic effects as compared to those working under mixed environmental conditions or in the open. Keeping in view the adverse effects of tobacco inhalation on the genotoxic effects in bidi rollers as an occupational hazard and in order to minimize the hazardous effects, it is recommended that masks should be worn by the bidi rollers during work to minimize inhalation of tobacco dust. Gloves should be worn particularly if there are bruises etc. in the palm. To minimize the absorption through eyes, covered glasses should be worn. The entire process of bidi rolling may be done preferably under well ventilated conditions. Due care to be taken to sit in the direction facing the direction of wind to avoid inhalation of blown away tobacco dust. The authors are indebted to the bidi rollers and non bidi rollers who participated in this study. Authors are also thankful to Dr. S.N. Shukla and Dr. Ripul Mehrotra, Department of Chemistry, Govt. Model Science College, Jabalpur for their support during thioether estimation. 1. Bhisey A, Govekar RB. Biological monitoring of bidi rollers with respect to genotoxic hazards of occupational tobacco exposure. Mutat Res 1991;261:139-47. 2. Bagwe AN, Bhisey RA. Occupational exposure to tobacco and resultant genotoxicity in bidi industry workers. Mutat Res 1993;299:103-9. 3. Govekar RB, Bhisey RA. Elevated urinary thioether excretion among bidi rollers exposed occupationally to processed tobacco. Int Arch Occup Environ Health 1992;32:101-4. 4. Kilpikari I, Savolainen H. Increased urinary excretion of thi oether in new rubber workers. Br J Ind Med 1982;39:401-3. 6. Nadin SB, Laura MV, Daniel RC. A silver staining method for single- cell Gel Assay. J Histochem Cytochem 2001;49:1183-6. 7. Comet assay IV. UK: Perceptive Instruments Ltd.;  Available from: http://www.perceptive.co.uk/. [Last accessed on 2011 Feb 18]. 8. Aringer L, Lidums V. Influence of diet and other factors on urinary levels of thioethers. Int Arch Occup Environ Health 1988;61:123-30. 9. Tice RR. The single cell gel/Comet assay: A microgel electrophoretic technique for the detection of DNA damage and repair in individual cells. Oxford, UK: BIOS Scientific Publishers Limited; 1995. p. 315-39. Sabale, R.V. and Kowli, S.S. and Chowdhary, P.H.